Citigroup has published an analysis of the costs of various energy sources called “Energy Darwinism II.” It concludes that if all the costs of generation are included (known as the levelized cost of energy), renewables turn out to be cheaper than fossil fuels and a “benefit rather than a cost to society,” RenewEconomy reports. “Capital costs are often cited by the promoters of fossil fuels as evidence that coal and gas are, and will, remain cheaper than renewable energy sources such as wind and gas. But this focuses on the short-term only — a trap repeated by opponents of climate action and clean energy, who focus on the upfront costs of policies. Actually, fuel costs can “account for 80 per cent of the cost of gas-fired generation, and more than half the cost of coal,” RenewEconomy says. The graph above shows that the lowest-cost wind (in the best regions) is already beating coal and gas. 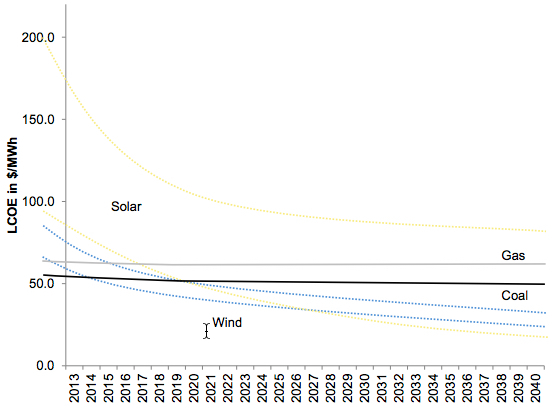 Solar in the sunniest regions will do so by 2020, based on conservative estimates. And the cost of solar and wind will continue to fall, with solar eventually beating wind, RenewEconomy projects. Citigroup estimates a “learning rate” of 19 per cent — meaning that solar costs will fall that much with each doubling in capacity (a variation of Moore’s Law). This translates into cost falls of 2 per cent a year. “We should think of installing renewable energy as a benefit rather than a cost to society,” Citigroup writes.